Susan Boyle to Her Bullies: "I’m All Grown Up"
A huge crowd stood in the New York morning chill, cell phones and camcorders held before misty eyes to record a simple woman dressed in simple clothes singing familiar songs in a voice that penetrated deep into the spirit. 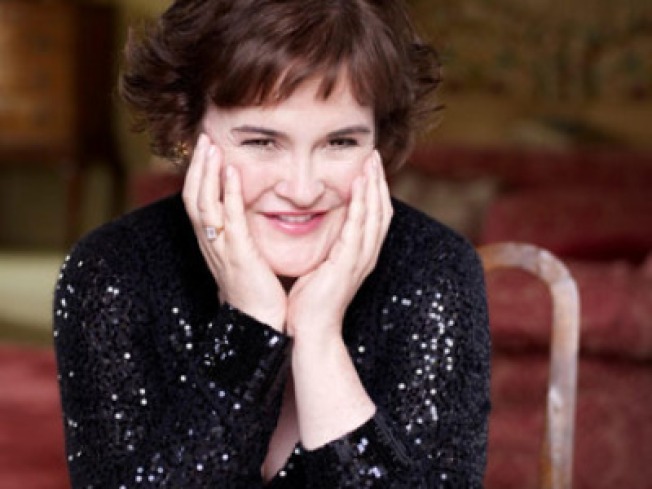 Susan Boyle, seven months removed from her now legendary debut on “Britain’s Got Talent,” is no longer the shy and dowdy woman who walked on the stage that fateful night to smirks and sneers — and left to a thunderous standing ovation. “I’ve grown up a bit. I’ve become more of a lady. I don’t swivel my hips as much, you know?” Boyle told TODAY’s Matt Lauer Monday before unleashing her extraordinary pipes on the crowd waiting for her in Rockefeller Plaza. The 48-year-old Scottish woman who was taunted and beaten as a child now laughs easily a herself and remains humbled and awed by her own fame. Never before had an artist releasing a debut album been invited to sing for a full half-hour on TODAY. Until Boyle. On Monday, the product of that triumph, her 12-song debut CD, went on sale. Even before it hit the stores, it was already the biggest advance CD seller in the history of Amazon.com. This year alone, Boyle has sold more advance copies than U2, Bruce Springsteen, Coldplay and the Dixie Chicks. “You’re one of the most talked-about, one of the most Googled, one of the most Internet-viewed women on the planet,” Lauer told Boyle, who is one of the selections for Lauer’s “People of the Year” special that will be shown Thanksgiving night, Nov. 26, at 9 p.m. (ET) on NBC. Boyle chuckled at the encomiums. “It feels very surreal, as if it’s not really happening,” she said. Eleven of the songs on the album are covers and one is original. They are not all show tunes, but they are all soulful, including a rendition of the Rolling Stones’ “Wild Horses” in a style much different than Mick Jagger could ever have imagined. Boyle also sings a Madonna tune, “You’ll See,” that she said is her answer to the teachers who beat her regularly with a belt and the classmates who so cruelly taunted her when she was growing up. “That was a statement I was trying to make, because I was bullied a lot at school: ‘You may have done that to me when I was younger, but you can’t do it to me anymore. I’m grown up now,’ ” Boyle explained softly. The youngest child of a family of nine, Boyle was deprived of oxygen at birth, causing mild brain damage and developmental problems. She spent most of her adult life caring for her parents until their deaths in a humble rented cottage in a remote area of Scotland. After her mother, Bridget died in 2007 — eight years after her father’s passing — Boyle lived depressed and alone with her cat, Pebbles. She didn’t even have the energy to go to the karaoke nights at the local pub that had given her an outlet for her singing and a source of joy. But Boyle’s mother had always encouraged her to try out for “Britain’s Got Talent.” She finally did this past spring. The rest is history that’s still being written. “My mother was a very lovely person, very unique and very caring,” she said during a break in her concert. Boyle did not win “Britain’s Got Talent,” but her fame was secure nonetheless. Overwhelmed by the attention and the pressure, she had a rough go of it initially. But Simon Cowell stood by Boyle while she had a brief stay in a psychiatric facility and pulled herself together. Today she remains the simple woman she was, but much more sure of who she is and the depths of her own talent. “The things which mattered to me before ‘Britain's Got Talent,’ they still matter to me now: my faith, my friends, family. I'm not so cooped up now; I'm part of the world,” she once said. Monday, on the Plaza, she met part of that world. There wasn’t a dry eye on the block. Susan Boyle is one of the people who will be profiled on Matt Lauer’s “People of the Year” special Thanksgiving night, Nov. 26, at 9 p.m. (ET) on NBC.